I just wanted to let you know how we are getting on. 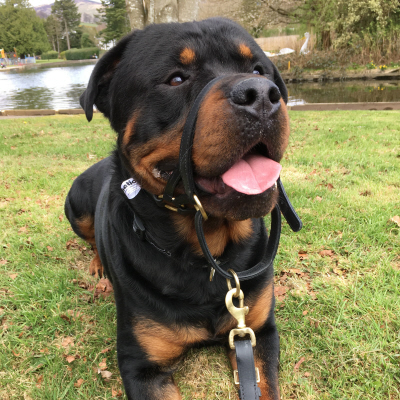 Brody is 2 now and nearly 50kg and since being a puppy has been quite fearful of other dogs since being attacked by a dog that was not on its lead whilst walking along a farm lane in our village. We had nowhere to go and ever since then he has not liked other dogs...even tiny ones!? Unbelievable when you see his size! 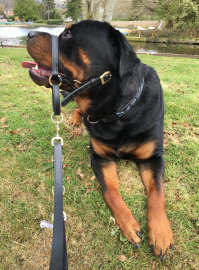 Unfortunately his fear now shows as aggression towards other dogs as he rears up onto his back legs and barks...especially if we turn a corner and he's taken by surprise!? I haven't been able to walk Brody since that time as he's grown stronger and too much for me to handle. I would just like to say thank-you for giving me my walking time back with him thanks to our new lead and collar! If he didn't pull as much that was a bonus for me...what I was most sad about was that I didn't feel like I had the confidence to control him on my own. 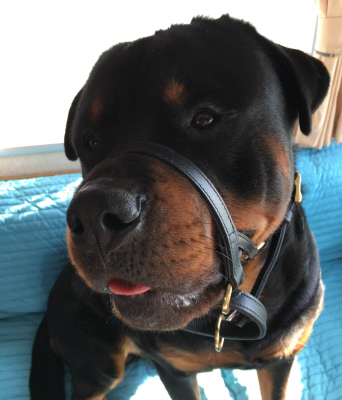 My husband has had to walk him whilst I walked our older Rottie Enzo...who is nearly 12! At the bottom of my e-mail I've attached a few photos of Brody in Scotland wearing his new collar!